Привет, хаброчитатели! Мы с классными новостями. Как только наши коллеги узнали, что Michel Weststrate готов сделать воркшоп в Москве, сразу собрали группу желающих. И решили разыграть два билета на мастер-класс среди читателей хаброблога. Про воркшоп и условия розыгрыша читайте под катом. MobX is one of the most downloaded packages in the React ecosystem. Yet you might not have used it. MobX takes reactive programming to the next level and turns your state into a big, reactive model. The result of that is very straightforward, concise code. For which reason is used in large companies like Microsoft (it powers the new outlook web), SAP and Amazon. In this workshop, we will learn all you need to know about MobX and MobX in combination with React. We will start with the basics. What is the philosophy behind MobX? How do you reason with MobX. What is transparent reactivity? You will learn how MobX boosts productivity, but also how to avoid common pitfalls. You will see how you can use MobX to crank out PoCs. And we will discuss how MobX is used at Mendix to manage a problem domain that is described in more than 1500 classes. In the afternoon we will dive into some more advanced subjects, like modeling asynchronous processes and state hydration. We will take a look at the basics of Mobx-State-Tree, which helps organizing complex problem domains by providing clear architectural patterns, an API to declare your state shape and all the tools needed to do advanced stuff like time travelling, undo / redo, patch generation, middleware etc. Even when you don't plan on using MobX it yet, just take a day to make yourself familiar with a different way of state management and use it as inspiration. 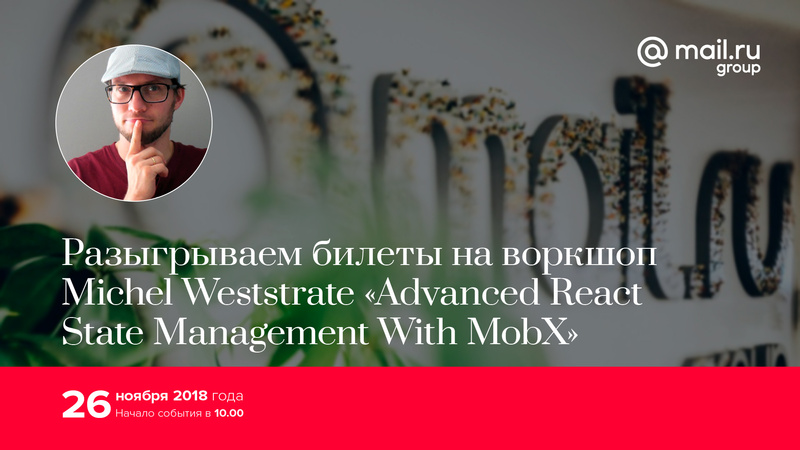 Michel Weststrate является автором библиотеки MobX — нового мирового тренда работы с состоянием приложения в frontend-разработке. Для участия в розыгрыше необходимо прислать вопросы (на английском языке) на тему работы с состоянием на клиенте. Право выбора победителей оставляем за Michel Weststrate. Автор наиболее понравившегося тренеру вопроса получит место. Вопросы принимаем через форму до 16 ноября. Победители будут объявлены 20 ноября. Московский офис Mail.Ru Group, Ленинградский пр-т, д. 39, стр. 79. Why we need React.js, if every [DOM] node may controls by MobX reactivity? Артём Арутюнян. What is the best practice to keep state consistantcy during async code execution? Сергей Уткин.